While Bella Lume and Labelsonthefly.com experience may not be revolutionary, and the idea of building relationships is not new, I was thrilled to read this post and know that some companies out there are getting it. LabelsOnTheFly.com offers a variety of standard sizes for labels, but sometimes the size that is needed for a product is not a standard size. Bella Lume and Labelsonthefly.com Last year, Labelsonthefly.com received a phone call from Brenda M. that started a great working relationship. Bella Lume is a company that makes high quality candles and scented oils that are inspired by aromas from around the world. Brenda was looking for new labeling that would make her products look as exquisite as they smell. 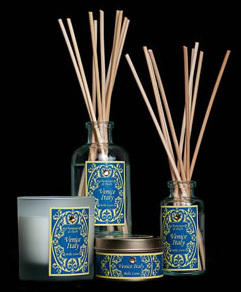 Bella Lume candles and reed diffusers were selected to appear in the Intentional Emmy celebrity gift bags in 2010. Bella Lume continues to be a valued customer, and we wish them the best of luck for continued success. This entry was posted in Online Marketing and tagged bottle stickers, candle-labels, cented-soy-candles, craft-labels, custom-design, Emmy Award, Emmy Award gift bags, Emmy gift bags, favor-tags, Intentional Emmy celebrity gift bags, personalized stickers, personalized-candle-labels, personalized-labels.